Why look for a salon when you can get excellent makeup services sitting at home? If you're looking for Bridal makeup in Delhi just use the UrbanClap app. All our makeup artists are well-trained and experienced professionals; you can expect nothing less than the best bridal makeup in Delhi on your big day. Find and hire the best bridal makeup artist in Delhi on Urbanclap, and leave the rest to us. Very nice make up done for my best friend...thanks to her. Harpal did total justice to her job. I had hired her for makeup and hair for a reception. We were 2 people who availed both the services while a few more people just took help with the touch up. I was extremely happy with her work. She was totally dependable and professional. Her ability to handle everything so calmly was what I absolutely loved about her. She was very friendly and humble. Her prices were reasonable too, keeping in mind the quality of her work. Not applicable she was not the artist i higer . There was bug in application and it pointed on wrong side . Rupali was the artist and feedback for her is good . She did good makeup for me. 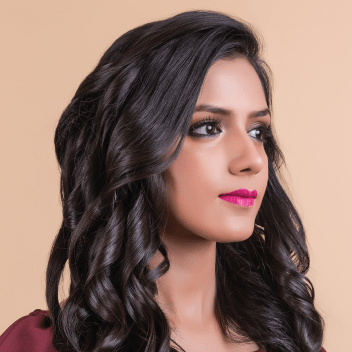 Thoroughly Check Out Portfolio - While you might like the looks for bridal makeup in Delhi that they have shared on their website or social media, it is important to ask for their portfolio as well. What you should look for in their work is a variety of looks from simple to bold. It’s a red flag if you see a similar look on every bride. Diversity is the key because it shows that the artist can work with different skin types, skin tones, style preferences, etc. and customise the look as per your wish for your bridal makeup. Their portfolio will also give you a sense of their individual style - while some makeup artists prefer heavy eye makeup, another might like to keep it more natural. Ask if they have bookings with other brides on your dates. If the answer is yes, ask if she has ensured there is plenty of time in between the 2 (or 3 appointments) taking travel time and any unexpected delays into account. You don’t want the MUA to be rushing through your bridal makeup. I’ve Found 2-3 Bridal Makeup Artists in Delhi I Like. How Do I Finalise One? Once you’ve found a few whose work you’ve liked, speak to them on the phone and find out if they’re free on your wedding dates (Sangeet, Wedding, Reception, etc) and if they are, understand what type of makeup they are trained and experienced in using as well as what brands of products they use. There are three types of bridal makeup - Traditional, HD and Airbrush. While Airbrushing is a makeup technique, the other two are types of makeup products. This is the standard makeup that’s been popularly used on almost every bride for the past few decades. Your MUA will be using the professional line of makeup products. Traditional makeup is the most versatile and can be used for any occasion, on any type of skin and using any method (brush, fingers, sponge, etc). Most are not waterproof, though, and can be used to give anywhere between a sheer to heavy coverage. While there are other types of makeup available as well, there’s nothing “wrong” with traditional makeup. As long as your MUA is an experienced, skilled professional, you will get a good result with traditional makeup as well. Of course, if you have problematic skin, this makeup type might show up on the camera since the MUA will have to use more makeup to cover the problem areas. With HD cameras, there came a need to create HD makeup. It’s basically makeup that has been made using ingredients that work to give your face a more flawless finish under the scrutiny of high definition cameras that reveal every flaw and caked on makeup. This makeup is more liquid and slightly more sheer than traditional makeup. However, it offers high coverage on application. It looks natural and great in photographs. It’s makeup that is applied via a spray gun. Because of the technique involved, the makeup comes out in a thin, even layer and gives a skin-like finish. The fine mist makes your true skin tone show through, so it’s the most natural looking finish that’s never cakey. This is waterproof makeup and as long as you “dab” tears and sweat (and don’t wipe them away), it can last upto 16 hours. One of the advantages of airbrush technique is that the foundation oxidizes with the air as it’s sprayed out from the gun, so you see the true colour as soon as it’s on your face. Whereas, with other makeup application techniques, the true colour for the foundation takes 15-20 minutes to show up. It’s a highly precise way of applying makeup, which is why the MUA can go in and out of problem areas easily. Which is why, contrary to popular opinion, airbrush is actually a better technique for problem skin since you can control how much makeup to apply on these areas. Yes, it’s more sheer but on HD cameras, the problem showing through slightly looks better than cakey prominent makeup. The makeup looks well-blended because the technique allows for it naturally. Many brides have tight budgets for their wedding makeup in Delhi and need to find an airbrush makeup artist in Delhi who offers services at affordable prices. This does not mean that they have to compromise with the quality since plenty of wedding makeup artists in Delhi offer their services at affordable prices. Some of them offer bridal makeup package prices in Delhi starting at Rs. 8,000 and going up to Rs. 30,000. The bride can choose the makeup package based on her budget and choice. Here are standard charges that our bridal makeup artists in Delhi charge their clients. If you book the same MUA for multiple events, she will give you a discount on the overall price. If the MUA has to travel to a different city, travel and accommodation expenses are borne by the bride. What does Bridal Makeup include? It is important to have a trial session at least one month before the wedding. The trial session enables you to truly test the capabilities of the makeup artist and also to make any changes to the makeup look if it turns out to be different from your expectations. Never hire a makeup artist who is hesitant to book a trial session or share the list of services for bridal makeup with prices. Most bridal makeup trials are paid. Full-face trial: The MUA will show you a complete makeup look - just not done to perfection as she would on your wedding day. 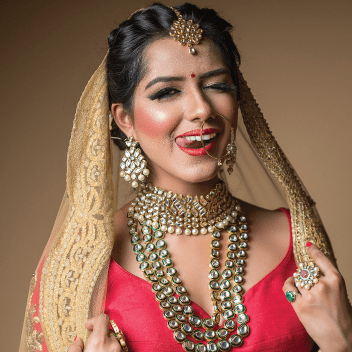 These cost about Rs.1,500, which is why some brides choose to get this done right before an actual party or date night, so that they can “utilize” the makeup. Half-face trial: The MUA will apply makeup on one side of your face so you can compare it to your natural look. She may also show you two different eye makeup looks (one style on each eye) or show you two different types of makeup (traditional vs airbrush) on each side. Any payments made for a trial are adjusted into your final payment, if you do end up booking that makeup artist for your wedding makeup. Ideally, you should talk freely to your MUA about what kind of makeup you like and show her reference photos of the style you prefer. If your outfits are already finalised, show her their photos as well so she can understand how to create complementary looks. Ask her about which products she uses and which ones she thinks will suit your skin type. Discuss eyelash and hair extensions, and any worries you may have. Once you’ve spoken to each other and gotten comfortable with what she’s going to do, begin the trial and observe what she’s doing and listen to what she’s saying carefully. Ask a trusted friend or relative to take the trial on your behalf, and share extensive notes with them on what you’re expecting from the MUA. In addition to this, have a video chat with the MUA after the trial to discuss any finer details and get a sense of how well you get along with them. Whether it’s blended well - check for any hard lines in your makeup. Ideally, the foundation, blush, contour and eye makeup should all blend seamlessly into each other. Click photos of yourself to see what the makeup is looking like in natural as well as artificial light. In particular, see if the foundation is the same shade as your skin, that the MUA concealed any blemishes and acne marks on your face, and if your dark circles are suitably reduced (if they’re completely concealed they could potentially look unnatural). Consider how long your makeup lasts for and if it suits your skin type. 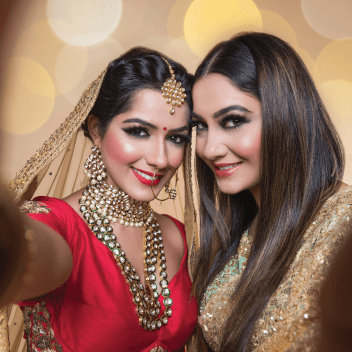 Ask Relevant Questions - Connect with the makeup artists and ask them a few important questions before hiring one for your bridal makeup in Delhi. Ask which makeup products they will be using, especially if you have sensitive skin or you are allergic to certain ingredients. Furthermore, ask questions about the cost of bridal makeup in Delhi to get an idea of the amount you will be paying for their services. If an artist is offering their services at considerably lower prices, enquire about the products and ask them how they will maintain the quality. Do not let low price sway your decision and try to balance the bridal makeup cost with quality. Ask About their Hygiene Practices - You should find the makeup artist’s kit looking organised and clean, with most makeup products in a good condition. The makeup artist should also follow good hygiene habits and keep the makeup products free of germs. They should use clean brushes, washed makeup sponges, disposables mascara wands, mixing palette for products and regularly sanitise makeup. Avoid the makeup artist whose makeup kit looks unhygienic or unorganized - they should be using clean brushes on your face and should have a good idea of where each product is kept in her bag. Don’t book such a makeup artist for your big day even if they are offering their services for bridal makeup in Delhi at a low cost. Share Your Vision and Check their Reactions - Some brides may prefer a bold lipstick or eyes while others may want a simple classic look. Make sure that the bridal makeup artist is paying attention to your preferences. Show them the makeup inspiration photos you have gathered from the internet or magazines and let them suggest ideas for the complete look they can create for you. Do not hire a makeup artist who is ignoring your requests and forcing her/his opinions on you. A good makeup artist always pays attention to what his/her clients say. If you can, book the same bridal MUA for all your functions. It will not only save you money because of bulk discount, but also allow you to get comfortable with the MUA with each function. For example, if your MUA applied eye makeup that ended up looking more intense than you typically like on your Sangeet, you can ask her to tone it down on your wedding day so that it’s more to your liking. Any additional people you want to get makeup, hairstyling or draping (dupatta or sari) done for, so that the MUA is not taken by surprise during the actual appointment. We strongly recommend hiring a separate party MUA for your wedding party, as the bridal MUA will in all probability not have the time to cater to anyone other than the bride. You can always request your own MUA to bring along additional people as part of her team to take care of your sister, mother or other friends and relatives.